What a weekend! This Saturday was one of the best events CC has hosted. 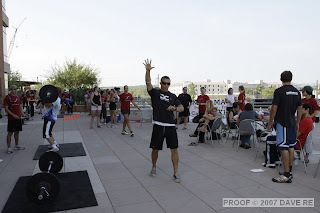 We had 49 people do the signature Crossfit.com workout Fight Gone Bad. There was over 80 people present at Whole Foods Pavilion and two bands The Murdock's and Black Noise Revival played great music. I could not have been happier with my best Fight Gone Bad Score to date 396! 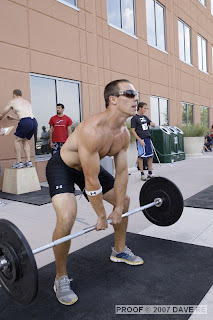 The first time I performed Fight Gone Bad I was in Golden Colorado at my first Crossfit Cert. I scored 286 not bad for my first time but Greg Amundson Scored 450+ that weekend. The best thing about the whole event, we raised almost $6000.00 for Prostate Cancer Athletes for a cure. This event was awesome! I'm sore. Way to go on the $6000! it looks like the back is a bit flat--Great Job! Thank you for making a difference.